In a busy warehouse or factory it is important to ensure that fragile goods are protected. One of the ways this can be done is by making sure that pallets containing more delicate goods do not have things stacked on top of them. These handy pallet toppers are designed to stop that from happening. They can also be used to prevent pallets from being stacked up too high, ensuring that safety standards are adhered to. 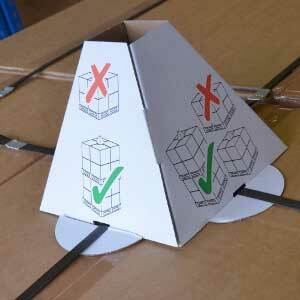 These pallet toppers are supplied flat in packs of 100. They are made out of pre-creased cardboard, which makes it easy to fold them round and form into pyramidal warning signs. They can be secured by slotting them together. The mere presence of an object like this on top of a pallet discourages people from casually placing another pallet there. Their distinctive shape makes them much easier to spot than flat signs and the clear graphics, with bright red and green crosses and ticks, make their message clear without the need to read anything. Using pallet toppers makes goods safer and keeps things running smoothly in the workplace, with no need for delays while people ask for instructions. They can potentially be re-used but are cheap enough to throw away when they start to wear out. They can also be recycled, making them a simple but very useful product.